Back in 2005, Contini’s Karmis was made with 100% Vernaccia di Oristano grapes, but it could not be labeled Vernaccia di Oristano because it would have had to age a minimum of two years by law – and three years for the Riserva - before hitting the market, while the Continis, who make enough different Vernaccia di Oristano wines as it is, preferred to have this to be easier going and ready to drink, and so it was labeled simply “Vernaccia”. 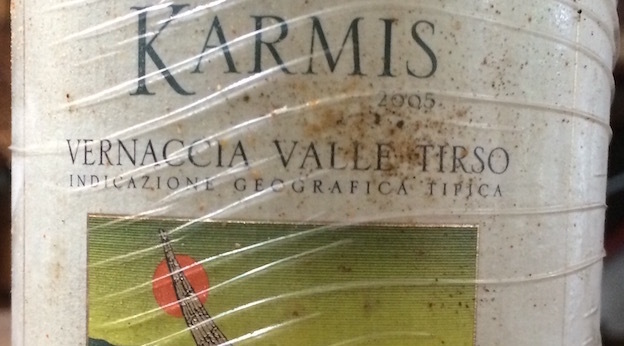 The 2005 was the last vintage of Karmis made as a monovariety Vernaccia di Oristano. Since then the wine is a roughly 75-25% blend of Vernaccia di Oristano and Vermentino. Vernaccia di Oristano (not to be confused with Vernaccia di San Gimignano, an unrelated Tuscan variety) wines are one of the world’s best-kept secrets, and Contini is the recognized master of the grape and the grandiose, Sherry-like wines it gives. The wines are made with the solera method, and can be anywhere from Fino-like to Oloroso-like, depending on the vintage. The key, much like Sherry, is the formation of the film of flor on the wine’s surface. Contini’s 2005 Vernaccia Valle del Tirso Karmis is bright amber-gold. Orange peel, soy sauce, butter, and tangerine jelly soar on the complex nose. Smooth and clean, with spicy crystallized ginger, apricot paste and quince flavors, this delicious wine has a bright, multilayered personality. The 2005 finishes long, with a delicate hint of bitter almonds and hazelnuts that adds nuance. It might remind you of a very good Amontillado. Remarkably refined, but rich and round, the 2005 is ready to drink now, so I wouldn’t hold onto it much longer. 94/Drinking Window: 2016-2026.